Add a pretty tag to your next elegant host/hostess gift! This would look great on a basket of goodies, a candle, or of course a bottle of wine! 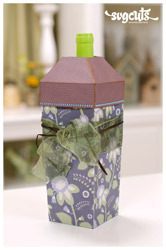 You can even dress up your bottle of wine in a handmade wine box using our Classic Gift Boxes SVG Kit! Just pick out your pretty paper, let your machine do the cutting, and glue it together! These grapes would also look fabulous with a dusting of glitter. Happy crafting! This is so adorable!! Thank you! Thanks for the grape file! I didn’t have any SVG grape files. Would look great on a card! Thank you for this lovely grape tag. Will make a great tag when giving a bottle of wine as a hostess gift!! Thank you for the freebies. I look forward to adding to my collection. They are great! Thanks so much! 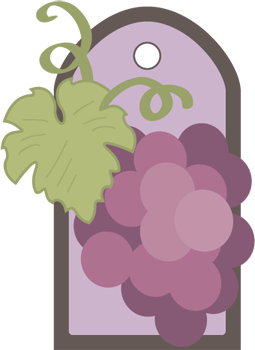 this is so timely – I’m doing a layout of a winey trip and this tag will fit in perfectly. Thanks these SVGs are absolutely beautiful and so great to use, the designer of them has a lot of talent, thank you. I just downloaded the grapes tag. Thank you so much for your generosity in giving this to us. I’ve been hunting up a grape leaf cutting file for some wedding decorations and this was absolutely perfect! svgcuts always have nice file, whether its free or to buy! Thank you for the darling wine tag. So cool to add for hostess bottle of wine.